BeAScout.org is that website. It is the first thing many prospective Scouting families see about the BSA, and it tells them what Scouting is, why it’s a good fit for their family and where they can find a Cub Scout pack, Scouts BSA troop, Venturing crew or Sea Scout ship near them. That last part — the where — is where you come in. 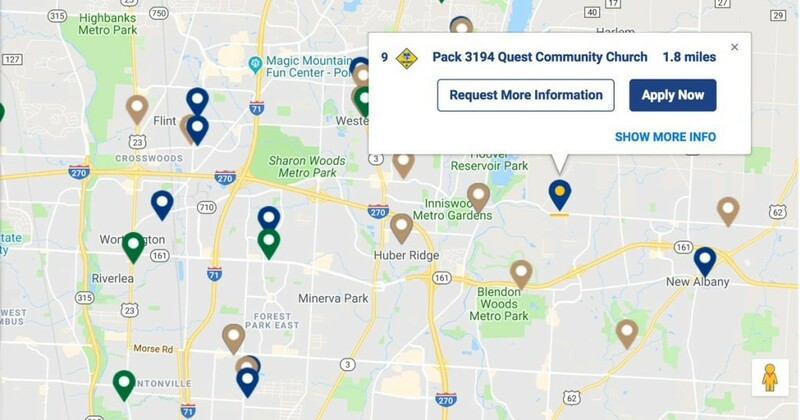 It’s time to update your unit’s listing on BeAScout.org, and I’ll tell you why. You see, when moms and dads visit BeAScout.org, they can enter their ZIP code to find all the Scout units near them. These results show up as pins, with each representing a pack, troop, crew or ship nearby. If your unit is represented by one of those pins, you want that prospective Scout parent to have a direct line of communication to you. That way you can tell them all about how awesome Pack 123 is or what makes Troop 456 so great. There’s just one problem: some units haven’t updated their pins, meaning there’s an extra obstacle between you and a new member of your unit. But don’t worry. Updating your pin is easy, and it’s well worth your time. Updating your BeAScout.org pin is simple, and it’s a good way to make sure your information is current — that it doesn’t list last year’s Cubmaster or meeting time, for example. Access to update your pin is available to all unit leaders, including committee members in a unit. In the drop-down menu, go to Legacy Web Tools and select BeAScout. Choose “unit” (rather than council) under “Unit Pin Mode” to update the pin with your contact info. Note that it may take a few hours, or up to overnight, for the updated information to show up. For Cub Scout packs: You’ll also want to go to Organization Manager and identify your pack’s gender: all-boy, all-girl or a mix of all-boy dens and all-girl dens. Under Organization Manager, find the settings tab and scroll to the bottom of the page. The default is Boys Dens, but you can change that. Be sure to enter an effective date or it will not update the pin.